As well as all the Thai and north Thai fare on offer plus the usual wealth of weird and wonderful fruit, vegetables and herbs, you’ll find a few sit down spots at Nan’s morning market if you want to sample some local snacks or noodle dishes. Alternatively, plonk yourself down on the terrace of Coffee Sound opposite with a local Arabica and take in all the hustle and bustle. If you’re lucky you may even see a few hilltribe women who’ve come into town to buy or sell. In the afternoon the market action moves just around the corner. Note that the morning market still functions in the afternoon and the afternoon one in the morning; the names just indicate their busiest times and the latter does go into early evening. They are both lively and friendly, with plenty of tempting snacks on offer. Meanwhile a short but sweet walking street market sets up on the stretch of Phakong Road alongside Wat Phumin every Friday, Saturday and Sunday. It doesn’t go to infinity as per Chiang Mai’s Ratchadamnoen one, but the wide street is completely closed to traffic so you can check out the stalls down one side of the street then return by the second row on the opposite side. 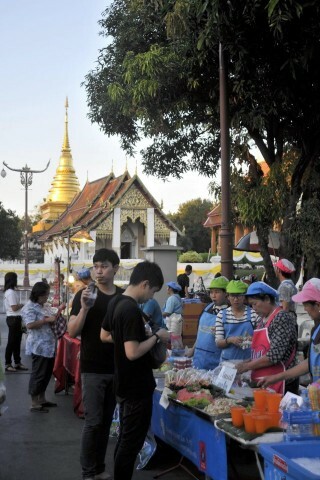 Like most of our favourite walking street markets, souvenir tat is kept to a minimum so you won’t see 27 stands selling identical carved soap dishes, but there’s plenty of great Thai and local food specialities here. An eating area with low tables and mats sets up in the open area – Khuang Muang – in front of the adjacent wat itself. This market runs Friday, Saturday and Sunday 16:00-21:00ish. Nan’s morning market is located smack bang in the centre of town off the central stretch of Pakhong Road, a block east of Sumondhewaraj and a couple of blocks back from the river. The afternoon market around the corner lies to the west side of Phakong along both sides of the lane leading up to Sumondhewaraj.